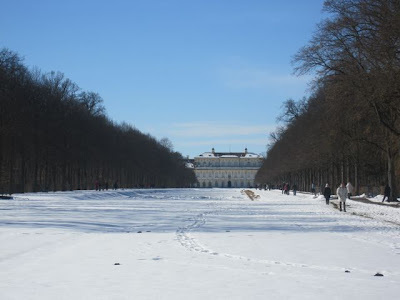 "All good things to those who wait" Hannibal Lector, "Silence of the Lambs"
Here are some quick, obscure little tips for the Munich area. 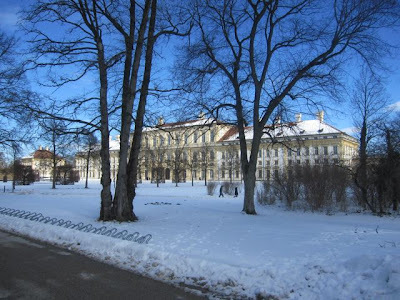 Recently, we stopped outside the Bavarian capital while going to and coming back from skiing in Italy. 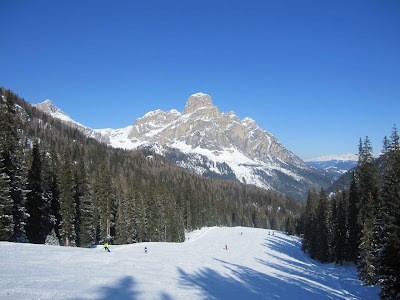 We think the Dolomites are the best. But that's not the tip. 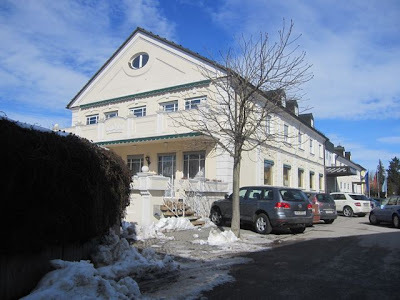 Anyway, to break up the road trip, we usually spend the night at a decent little hotel in Oberschleissheim called the Hotel at the Schlosspark - "Zum Kurfürst." It is notable for its great breakfast. 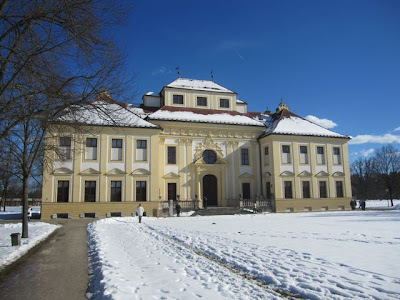 But also because it is just outside the gates of the giant park containing Schleissheim Palace. It's a great place for a walk on a sunny winter's day. Someday, we'll have to take a tour of the palaces on the grounds. But what I really care about is food, and we stumbled on a great, if ordinary-looking Greek restaurant called Poseidon, just down the road at Dachaur Strasse 1. For those who care more about tourism, the Dachau concentration camp is not far away, either. 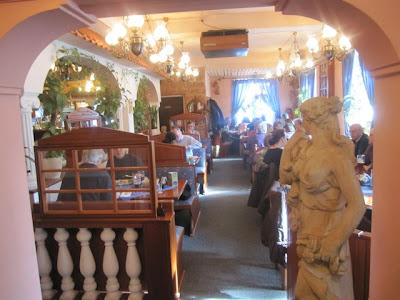 The restaurant is filled with statues and bad paintings. But that's not the attraction. 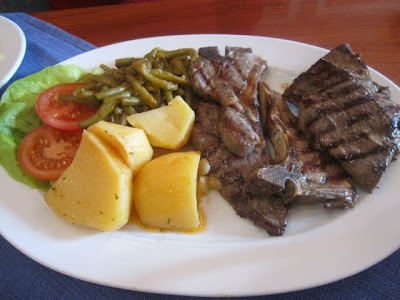 For us, it is their wonderful grilled lamb. V got the mixed lamb plate €13.40). It was tender, smoky, lamby goodness. She even loved how they did their potatoes. The beans had spices that she remembered from her childhood when visiting Yugoslavia. 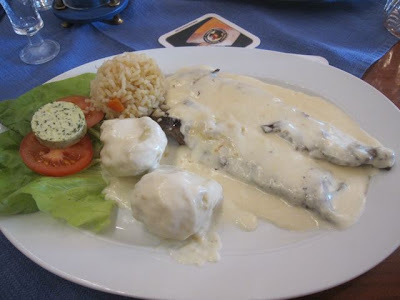 I had the lamb filet in lemon sauce (€13.40). It came with artichoke hearts and buttery rice. We first tried this dish several years ago at this restaurant (yes, we keep coming back). We didn't expect the lemon sauce to be creamy and thought it was some kind of mistake. But after one bite, we decided it was no mistake. It was just so right. The sauce was incredibly delicious, smooth and tart. We asked the waiter how it was made, but he had no idea. And the flavor of the charred lamb asserted itself above the sauce. But drivers be warmed -- every diner gets a chilled shot of ouzo with every meal. 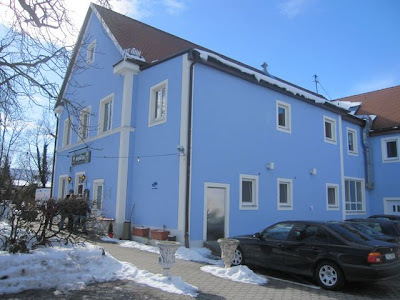 Bottom line: whenever we are driving past Munich, we will stopping at Poseidon for grilled lamb.